I learned an important lesson yesterday. Creepy crawly critters move fast and often unnoticed. I was getting some ribs prepared to go into the oven and needed something from the other fridge, the one on the back porch so I opened the slider, got my ingredients, came back in, closed the door and resumed my work in the kitchen. A few minutes later I heard something fall behind the turtle tank. I looked to see what those crazy turtles were doing in there that could possibly cause the extra filter pack to fall behind their tank and saw nothing but two turtles swimming frantically toward the glass. I shrugged it off as a work of gravity and went back to work. Until something moving caught my eye. 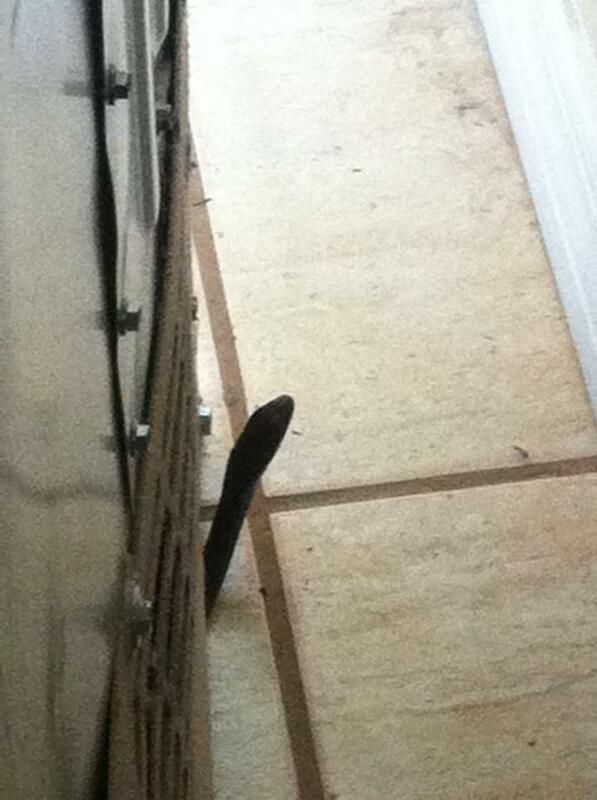 Right there in the middle of my dining area, slithering across the tile was a long black snake. I’m not necessarily afraid of snakes. I think they’re pretty nifty from a distance and when you know they’re there but when they appear suddenly, randomly, in places they should never be, the only appropriate reaction is to scream and run and that’s precisely what I did. My fifteen year old daughter was at the computer desk across the room and heard my screaming “it’s a snake!” and she (being terrified of snakes), screamed even louder and ran. My thirteen year old daughter waited a minute, unsure about what could possibly be going on, before emerging from her room and walking outside. Luckily, my six-year-old was already playing outside. So there we were, the whole family on the porch recovering from the shock. My neighbor heard us screaming and came over with a stick. Neither of our husbands were home. We ended up with two women, four girls under the age of 15 and one 6-year-old boy, in the house on the lookout for the slithery sinister being to emerge from the fortress he chose underneath my refrigerator. He was not coming out. Eventually, I resumed cooking while watching out one eye for him to fly out at my feet at any given moment. I had to get my ribs in the oven! After about an hour, he came out and another neighbor had arrived and our efforts to shew him out the door ended with him under the stove instead of the fridge. We removed the drawer under the stove and were poking things in there to coax him out and he was so scared he just wouldn’t come. Finally, my Pastor (also my neighbor) showed up and took over. We tried to get him out in a humane way, but the uncooperative little booger met his demise. Pastor, the hero, killed the snake and freed us ladies from the reign of the little tyrant. It was an adventure. When my husband got home, he mentioned that we should have killed him last week…Last week, he was on our front porch eating a frog. We all looked at him and tried to get pictures of nature in progress (which I would share, but they are terrible). We thought it was kind of cool. Black snakes are generally good to have around since they eat pests so we’ve let him live comfortably and close to our doors without much resistance. Still, my husband said we may have allowed him to get a little too familiar and comfortable with us making it more comfortable for him to sneak in the house. Either way, it made me think about the little things in my life that I don’t necessarily bother to deal with right away. I think sometimes we see sin lurking at the door and we don’t bother to totally get rid of it because since it’s not inside it doesn’t bother us that much. We may even think it’s kind of cool sitting out there. We may toy with the idea of looking at it and keep peeking out the door to check on it and see where it is. What we don’t realize is that when we allow it access to the close proximity of the door, it can creep in so fast that we never saw it coming until it’s there, stuck and we can’t get it out because it’s weaved into a crevice somewhere where we can’t even see it anymore other than the occasional moments where it rears its little head out from underneath. Maybe even in this, it takes Pastor with a shovel in hand to bash our little creeper in the head before we can grab it by the tail and get it outside. I often hear people talk of not opening the door for the enemy of our souls to come in. I contend we should take it a step farther and guard the yard. We should be like Joseph and RUN the second temptation comes along. James says “Then, when desire has conceived, it gives birth to sin; and sin, when it is full-grown, brings forth death.” James 1:15. I am determined to not even allow sin to be conceived in my heart instead of waiting until it’s in the house and trying to stop it. It’s much easier that way. Amen. It is good NOT to negotiate with sin—rebuke sin or flee from sin as if in terror. Beware of Greeks bearing gifts and beware or snakes asking questions. I love that…yelling “FLEE.” I shall try to remember that and introduce the idea among my family and friends. Intriguing read. Love how you go from the snake to the concept of becoming closer to God via diminishing sin. I liked the way you changed the snake into a metaphor into the devil. Very interesting. But then again was not the snake at the Garden of Eden. You think the snake is getting a bad reputation? It is funny how we characterize certain animals into a good or bad category. God said in Gen 4:7 that sin lies at the door and we need to master it. In my case, there really was a snake at the door. 🙂 The metaphor would hold true with any creepy crawler though I can’t really imagine it having the same effect were it a bunny or kitten. I guess we do categorize certain critters. It sounds like an adventure and I loved the way you brought it to a great moral at the end!! I’m sorry the snake had to die though. I understand what you are saying about sin at the doorstep and I think you are absolutely right that “we don’t bother to totally get rid of it because since it’s not inside it doesn’t bother us that much.” However, I don’t think violence is really ever the answer…especially in dealing with ourselves and our sinful habits. We must show compassion and love and understanding to ourselves, just like the snake deserved (granted I’m speaking in 20/20 hindsight and I wasn’t in your kitchen to be startled!). Next time you see a snake on your porch I hope you’ll move it to a safer distance so both you and the snake can live healthy, happy (un-startled) lives. I agree with you completely. Shame and condemnation are never necessary. God’s grace is always sufficient no matter what the circumstance. Prevention is a better way. How do you know it was a he? Don’t know about the sin part(sin is fun) but you did indulge him/ her to begin with. I hate snakes but did it really deserve to die!! Still, a funny Story. Great analogy. Thank you. We can be so oblivious to the subtle traps of the enemy. Takes lots of vigilance. The enemy never takes time off. I have to keep telling myself that when I’m feeling spiritually lazy. Thanks for the reminder! Wow. I have recently been struggling with what I should allow in my life. Trying to justify some of the slithery things that sit outside my door as being harmless and telling myself that I would never let me guard down, they will never really get in. Thank you for the well written and vivid story and message! I’m glad I could be an encouragement! I like your story. I know its true and you were very descriptive. You’re welcome. Can you look at my blog jojolablog.wordpress.com and tell me what you think??? WOW! What an experience! Was it a pisonous snake? Uh, sorry, I meant “poisonous” 🙂 Sometimes my mouse is faster than my mind. 🙂 And there is (luckily) no snake around to catch it. I was not going to read this. Because Freshly Pressed was real bad about the content they chose. Then I saw the Comforter. And we all need him. am I the only one really disturbed by the fact that the harmless snake was killed? 😦 guess they will never live down their bad rap… I’m glad you got some metaphorical insight, but ultimately the little guy perished out of fear. I wish we could have gotten him out another way. Trust me, it was never my intent for the little guy to die, we were trying very hard to get it outside. Again, an unfortunate result of us letting it hang out in close proximity to the house for so long. 😦 We’ve learned our lesson. the insight from the story reminded me of King Hezekiah in the bible, how he removed and tore down the ‘high places’ so that the people had no temptation to stray from God. You are right there are times that we choose not to deal with the seemingly ‘harmless’ issues like jealousy, envy, anger, lust etc, but they are there. And will get the best of us when we least expect it. When we got a snake stuck in the staff house at a camp I worked at, we used several sticks and a pair of tongs to get it outside. We got it to wrap itself around the tongues and then flung it out the door. However, maybe we should have left it to eat all the mice. I like your analogy, by the way. Great analogy! Love how experiences here and now teach us spiritual lessons as we go along. I didn’t see that one coming….or did I? One of the best articles and use of a metaphor I’ve read in a long time! I thought it was very good but perhaps the metaphor, after mentioning the similarity to sin, kind of reverted to lots of snake imagery that left the concept of sin very vague with no concrete details as to how the two are similar. I was left wondering what kind of sin you had in mind. Even so, I read it and it was good, as the bible says (I think). Well-told story, which kept me reading to see what would happen, with a good lesson. Thank you, Catherine! Glad you found me. God bless! Thank you! I have been trying to come up with a great way to get the word out about killing the sin before it enters the house (or running from it) and now you have given me the answer. The devil is not polite nor a gentleman. If we open a door to him; even “just a little” he uses that opportunity to kick the door in and quickly destroy as much of us as is possible. Great analogy that when we see a problem, deal with it immediately. If we don’t- bigger problems are ahead for us. I loved this! So awesome how you tied it all together. It’s so true how we put off the sin that we need to deal with and wait until it’s formed a stronghold in our life. This reminded me of 1 Peter 5:8- “Stay alert! Watch out for your great enermy, the devil. He prowls around like a roaring lion, looking for someone to devour.” Over time as we grow more comfortable with the sin, the devil removes the distance, and comes more & more in proximity to steal our lives. He wants to keep us from God and keep us from attacking him and praying boldly so he accues our sin and tells us we are disqualified. Thank God for His redeeming love & grace! Amen! His love amazes me more everyday. Whenever I feel like the devil is trying to sneak in my life I repeat The Lords Prayer. Our defense to sin is The word. Jesus himself was tempted by the devil, but thru knowledge of scripture he did not succumb to him.